Earth has been witness to mammoths and dinosaurs, global ice ages, continents colliding or splitting apart, comets and asteroids crashing catastrophically to the surface, as well as the birth of humans who are curious to understand it all. But how was it discovered? How was the evidence for it collected and interpreted? And what kinds of people have sought to reconstruct this past that no human witnessed or recorded? In this sweeping and magisterial book, Martin J.S. Rudwick, the premier historian of the earth sciences, tells the gripping human story of the gradual realization that the Earth’s history has not only been unimaginably long but also astonishingly eventful. Rudwick begins in the seventeenth century with Archbishop James Ussher, who famously dated the creation of the cosmos to 4004 BC. His narrative then turns to the crucial period of the late eighteenth and early nineteenth centuries, when inquisitive intellectuals, who came to call themselves “geologists,” began to interpret rocks and fossils, mountains and volcanoes, as natural archives of Earth’s history. He then shows how this geological evidence was used—and is still being used—to reconstruct a history of the Earth that is as varied and unpredictable as human history itself. Along the way, Rudwick defies the popular view of this story as a conflict between science and religion and reveals that the modern scientific account of the Earth’s deep history retains strong roots in Judaeo-Christian ideas. 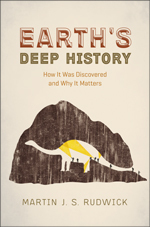 Extensively illustrated, Earth’s Deep History is an engaging and impressive capstone to Rudwick’s distinguished career. Though the story of the Earth is inconceivable in length, Rudwick moves with grace from the earliest imaginings of our planet’s deep past to today’s scientific discoveries, proving that this is a tale at once timeless and timely. I was at this talk last week and it is quite interesting. Chakrabarty sets out three propositions to help us start thinking about the climate crisis without the typical sets of assumptions about the workings of capitalism or imaginations of what is “planetary”. Click here to go to the page where you can view the video. I mentioned earlier this summer the book Is water H2O? My review of the book is now available at Water History. The book is excellent and I recommend it. The main drawback is the price – so request that your library purchase it and then get it that way. The strengths of the book are numerous as it offers a close reading of the works of Priestly and Lavoisier, to name just two of the late 17th and early 18th century scientists it considers. In addition, the book does quite a bit of philosophical work. My review tries to give a better overview of both the history and philosophy that the book covers – I’m not sure if it is open access or not.